The Gay Gamer: Boomerang or sword? You know that Zelda prototype mentioned in my last post? Well, unfortunately it isn't the version that gives players the option of beginning the game with either the boomerang or the sword. Does such a build exist? Probably--or at least it did at some point. 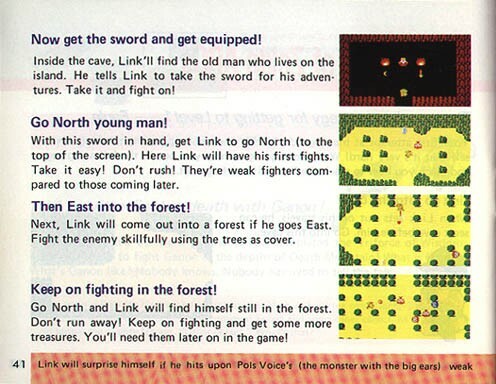 After all, it was mentioned in the instruction manual (see first screenshot below) that accompanied the North American version of the game. With any luck, that build of The Legend of Zelda will be the next to leak. That seems like an awful idea...leaving poor players without a sword! Yeah, I'm not sure how it would work, either. I'm guessing you'd be able to acquire the sword at some point. Totally unrelated to your post (although I had never noticed that screenshot before), but you've gotten me in the mood to play an old Famicom game. Thing is, I've no idea what to play -- although I'd prefer something somewhat obscure. Recommend a game... after I recover from New Years Eve, I'll give it a fair shot and write about it! Hmmmm, you've offered a stiff challenge, Zigfried! Another recommendation, which isn't all that obscure anymore, is Sweet Home, Capcom's RE-esque RPG for the Famicom. Two more options for you, Zigfried: Cocoron (somewhat-obscure Mega-Man-esque platformer) and Devil World (not at all obscure Pac-Man-ish game). I'll pick one within the coming week! Then I'll be sure to drag it out. BWAHAHAHA! Err... hopefully I'll post my thoughts over the weekend after playing the game. The best 16-bit RPG you've never played, eh?